Murugammaiyar, a lady devotee of Lord Subrahmanya, was born in South India. She was married to a young and rich man of her own caste. Even from her early days she showed an intense love to Lord Muruga. And it was for this reason that she was called Murugammaiyar. No mendicant or beggar who passed her door would fail to receive the munificent help rendered by the lady bhakta. The ways of Murugammaiyar did not suit her husband, who was rather a man of the religion of the flesh (meat-eater). His rebukes and punishments to prevent his wife from doing acts of piety had no effect. On the contrary, they increased and developed further the faith of Murugammaiyar in Lord Shanmukha. Worse still, the husband began to suspect the chastity of his wife as she was so much given to charitable acts and mixing freely with the wandering sadhus. 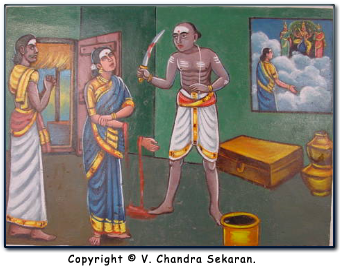 One day, it so happened that, being enraged much at the behaviour of his impertinent wife and instigated by his own worldly-minded delusions, the husband took a knife and cut off the hands of Murugammaiyar. But the dear Lord, for whose sake she had foregone even the love of her husband, could not brook the sight. The Lord appeared on the scene, restored the hands that had been cut off and revealed unto the world and her ignorant husband the intensity of her devotion to Him. He showered His grace on her and blessed the couple with a long and happy life of peace and plenty.